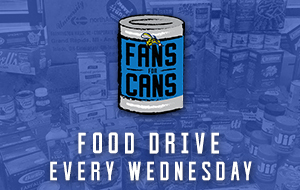 The Skeeters are proud to announce the beginning of the Fans for Cans food drive, taking place during each Wednesday home game here at Constellation Field to benefit the Houston Food Bank and the community. Each fan that brings in at least five items will receive a voucher good for free admission to any of our Wednesday home games. Be sure to look out for our table in front of the main gates on Wednesday evenings and our Houston Food Bank collection boxes to make your donation. For more information, call 281-240-4487. We'll see you out at the ballpark!